Rise in hunger at harvest time; harsh and prolonged 2016 lean season approaching. 8 February 2016, Juba – South Sudan is facing unprecedented levels of food insecurity, as 2.8 million people — nearly 25 percent of the country’s population — remain in urgent need of food assistance, and at least 40,000 people are on the brink of catastrophe, three UN agencies warned today. The Food and Agriculture Organization of the United Nations (FAO), the United Nations Children’s Fund (UNICEF) and the World Food Programme (WFP) stressed that these numbers are particularly worrisome because they show an increase in hunger during the post-harvest period — a time when the country is traditionally most food secure. The number of food insecure people is expected to peak during the coming lean season — traditionally worst between April and July — when food availability is lowest. Humanitarian partners have released an update to the Integrated Food Security Phase Classification (IPC) analysis, which projects that the lean season will start early this year, and the hunger period will be longer than in previous years. 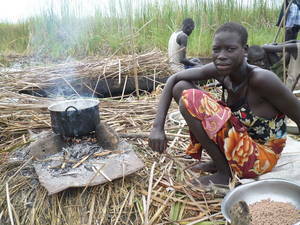 Internally displaced woman seeks refuge from the ongoing violence in the swamps of Unity state, cooking her last supply of sorghum.